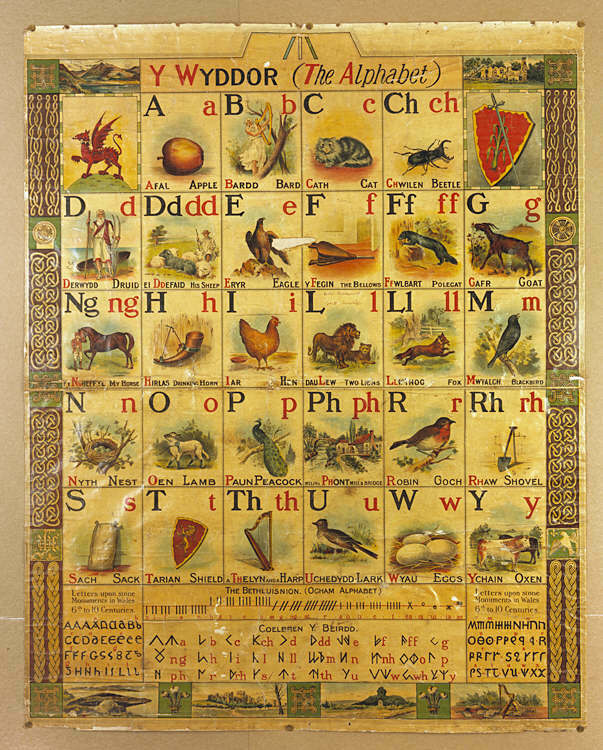 Here's a famously romantic poster showing Yr Wyddor (the alphabet) neatly illustrated around a 'bardic' (en, cym), or 'druidic' (en, cym) theme, including many of Iolo Morganwg's (en, cym) famous inventions, such as the nod cyfrin (en cym) and 'coelbren y beirdd' (en, cym). Underneath the poster I've given the names of the letters in Welsh. The pronunciations are given in Welsh, since it is to all intents and purposes a phonetic alphabet (or a WYSIWYG!) - and in any case, in what other language could they be!?. For guidelines, see the Pronunciation discussion. This list includes "j" which is absent from the poster for various intriguing reasons. Very nice--I especially like the Ogham and the Coelbren y Beirdd included at the bottom. I didn't know about the latter, so it was interesting to read the info at the link you provided. I can understand most of the pronunciation (a, be, ec, ech, di, etc) however 'i dot' and 'u bedol' have me confused. Used to seperate one 'ee' from another 'ee' ? But what does that have do to with pronunciation ? Ychydig o gymorth i fi, os gwelwch yn dda. Indeed, the names are there to distinguish the signs. In a 'southern' dialect there's no difference between the sounds of 'u' and 'i' (northerners will pronounce them quite distinctly). So I guess the distinction is there to help us hwntws know what's going on! self explanatory ?? I chi efallau, ond dim i fi (pen plocyn (block head)). dot = dot = . Does pedol imply umlaut ? The 'pedol' in 'u-bedol' just refers to its shape. But I suspect that might not have been your question...! to do with pronunciation as the others do. Sorry to be such a bother..
No bother at all! A pleasure to talk about these things. You're entirely correct - the names refer to the shape of the signs, and don't (at least to a hwntw) concern pronunciation. A gog would pronounce them differently, of course (their 'u' is distinct from their 'i'). Sorry that our wires seem to have been a bit crossed there for a bit. I hope things are clear on both sides now, and I look forward to your next question. I have this on my wall at home. My mum bought it for me! I didn't think there was a j in the Welsh language. I'll ask my sister in law who lives in Cardiff and is a Welsh speaker. It could be interesting to take a vote on whether 'j' belongs or not, to see where people's allegiances lie! It's true that it's pretty much only in borrowed words that it's used (mainly borrowed from, or imposed from, English), though many of these are now quite solidly in the language: jam, jac-y-do, joch, jiwbili, Jones, Jim, Jac, jo^c, jwg, etc. To be able to spell words like these we need to have a name for the letter, so I'm in favour of accepting it, for the time being anyway. Of course, if we go back just a few generations we'll find the letters "v" and "k" used in Welsh books and manuscripts, as well as other symbols which are no longer in use (such as the dotted "y" and the "6", not to mention ligatures and intriguing diacritics like dots under letters) - all these aspects have a habit of being fairly flexible over time (give it another fifty years and who knows what will be in and what will be out of our alphabets!? ).